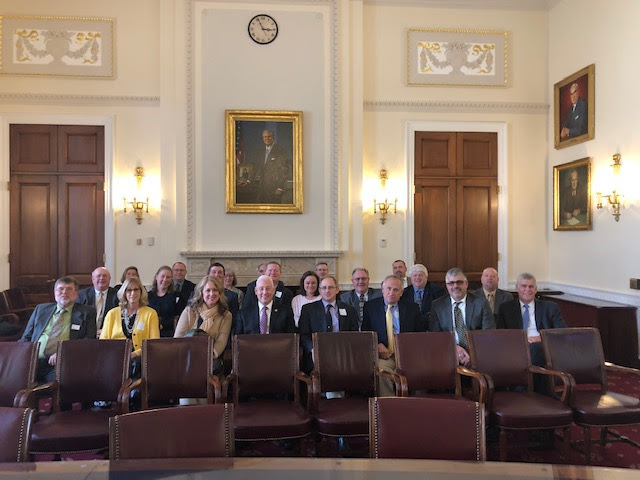 Earlier this month, Agricultural Retailers Association helped facilitate a successful visit to Washington, D.C., for the Premier Companies Board of Directors and Premier Companies staff. Led by former ARA Board Chairman Harold Cooper, and with assistance from ARA member Land O’Lakes, the farmer board for Premier enjoyed learning more about the legislative and regulatory affairs in our nation’s capital. The week began with a briefing from the ARA policy team covering priorities for 2019, followed by a Capitol tour before meetings on the Hill. The Premier team was able to meet with both Indiana Senators, Mike Braun and Todd Young, and continued with Indiana House Representatives Trey Hollingsworth, and Greg Pence. They were also able to meet with staff for Reps. Susan Brooks and Jim Banks. Attendees appreciated the chance to share this time with members and legislative staff, voicing what matters most to them – policies that support their freedom and license to operate; these topics included trade, immigration, infrastructure, transportation, and Farm Bill implementation. The following day, the group took a tour of the White House before a full afternoon of industry panels with ARA friends and leaders, including the National Council of Farmer Cooperatives’ Lisa Van Doren, the American Farm Bureau Federation’s Andrew Walmsley, National Cattlemen’s Beef Association’s Kent Bacus, Farm Credit Council’s Robbie Boone, with Andrew of the Russell Group moderating. The panelists were able to show how agriculture industry professionals in D.C. work together to form coalitions and affect change at the legislative and regulatory levels of government. These special partners assist in providing great strength to the collective voice of ARA members. The group then heard from USDA Foreign Agriculture Service Administrator Ken Isley. Administrator Isley gave an update on trade negotiations and foreign assistance. This discussion was met with great approval of the work being done at the agency level. Finally, Premier Companies heard from the Farm Foundation President Constance Cullman on the work they do to help educate on the agriculture sector’s most important issues.